While making my own nocino has not been a difficult process it does take quite a bit of time to rest and mellow. In part 1 I described the process of extracting the walnut flavors and creating the base liqueur. In part 2 I created a variety of spice mixes and decanted the fledgling nocino into nine glass jars. Most recipes I've seen suggest that after the spices have been added, to let the nocino rest for up to a year. So almost exactly one year later I decanted and filtered each jar using a V60 coffee setup. For some silly reason I shook the first jar which stirred up a bunch of fine sediment and took forever to filter. With each successive jar I was careful not disturb the sediment which made the filtering step so much quicker. As I filtered each jar of nocino I cleaned the jars so that I could reuse them. At the time I was doing this my wife and I had a 1 year old boy and I didn't have a lot of time to spend with the nocino so after each jar was filtered I put the contents back into its now clean jar and sealed it back up. My intent was revisit them the next week and see which spice mix I liked best. However, time has a way of slipping away from you when you have a baby so I didn't come back to retaste the nocino until more than a year after I filtered them. Tasting through each jar was very informative and a little disappointing. Except for the nocino that didn't have any spices added to it, none were good enough on their own to keep separate. In each one, the intensity of the spices was out of balance with the walnuts, sugar and alcohol. But, rather than throw them out I decided to blend some of them together and see if I could make the sum of the parts better than the whole. However, even after blending some of the jars together the results were less than stellar because I left the added spices to macerate for way too long. At this point the only hope I have of saving the nocio is by adding some mint to it and trying to transform it into a fernet which might work better with its current intensity of the spices. When I tasted the different jars of nocino there were a few things that were immediately obvious. The nut flavor and mouthfeel of the nocino made by desiccating the green walnuts with raw sugar before I added the alcohol was by far superior to macerating the green walnuts with alcohol and simple syrup. Macerating the lemon with the green walnuts, alcohol and simple syrup was way to long and it left a not so pleasant and bitter lemon flavor from the zest. Even though I tried to put small quantities of spices in each jar, I included way too much. while there are some that I like more than others, in the future I will need to use less spices per unit volume and it would probably be best. Macerating the spices for 12 months is too long. The nocino does need to rest for 12 months but it would be better to taste the nocino in week long intervals to see how the extraction progresses. In the end this was a fantastic project and even though I wasn't supper excited by any of the spices versions, I learned some excellent lessons that will make my next batch of nocino even better. Skip Rock Distillers was founded in 2009 by Ryan and Julie Hembree in Snohomish, Washington. In addition to their nocino they make a number of rums, whiskeys, vodkas and three other liqueurs. 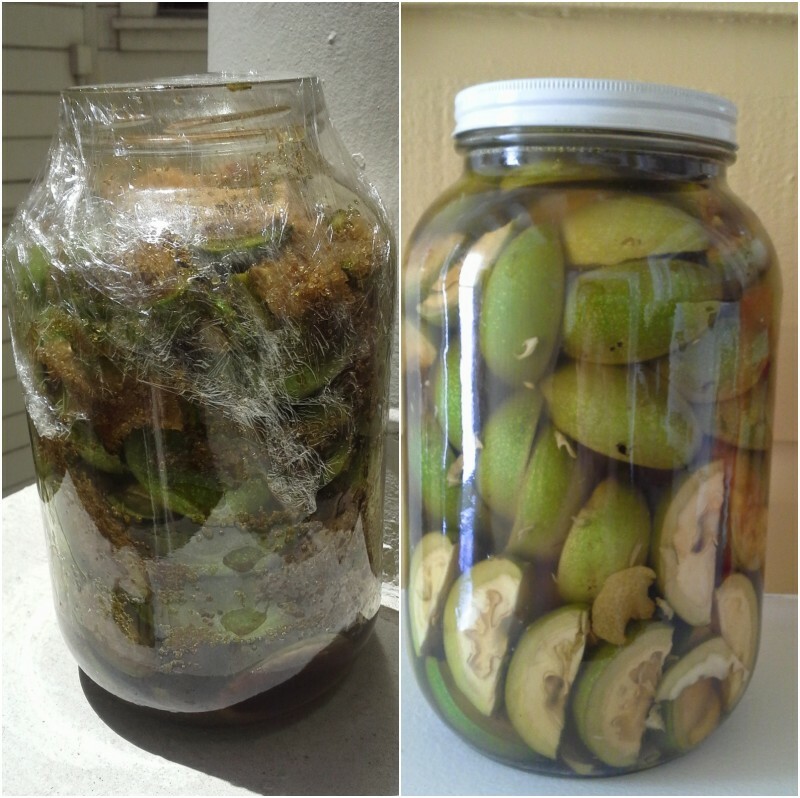 In 2014 when I began the process of making my own nocino, I mentioned it to Ryan in an email. While I picked my unripe English Walnuts from Bill Owen's tree on June 24th, the Feast day of St. John the Baptist (the traditional Italian harvest day for making nocino) in California, Ryan's walnuts weren't ready to harvest until mid July, due I assume to the higher latitude of Snohomish. Most of the unripe walnuts that go into Skip Rock's nocino are grown less than five miles from the distillery and some of them are grown right on Ryan's property. Once the walnuts are harvested, Ryan crushes them with a hammer mill and puts them in a 300 gallon tank to macerated in a high proof distillate they make just for the nocino. After a couple of months they drain off the infused walnut spirit and begin the process of adding spices and cane sugar which over the next couple of months becomes nocino. Once the all of the spices and sugar has been added, Ryan begins the process of slowly adding purified water to bring the liqueur down to bottling proof. Now fresh nocino is very bitter despite the added sugar and spices because of all the tannins that get extracted from the green walnuts. However, over time those tannins breakdown and soften. While most traditional nocino recipes say to let it rest for a year after making it so that it has time to mellow. Ryan has gone a step beyond. The most recent bottling of the Skip Rock Nocino has been resting for two whole years while Ryan brought the proof down. In that time, all of the bitterness has dissipated and the flavors from walnuts and spices have melded together into an incredible harmony. Nose: The nose is beautiful and fragrant, full of lemon and vanilla with an underlying aromas of nutmeg, toffee and cola. There is just a slight hint of alcohol but just enough to carry the aroma upward. Palate: Initially the taste is sweet but not over powering or cloying in any way. The nocino sits coolly on the tip of the tongue with a very pleasant acidity. As you begin to swallow and the nocino moves through your mouth the spirit awakes and becomes warm on the palate with notes of clove and nutmeg. Immediately after swallowing the flavor changes to chocolate. Finish: The finish lingers and is like semi-sweet chocolate, lightly sweet and slightly dry at the same time. The nocino made my mouth water which is a good sign for liqueur traditionally drunk to aid digestion after a meal. Conclusion: Ryan's nocino can be drunk neat as an after a meal and it works nicely as a substitute for sweet vermouth in cocktails. A Midnight Manhattan with Evan Williams, Ryan's nocino and a dash of Aged Citrus Bitters from 5 by 5 Tonics Co. makes a really great drink that is perfect for the cold winter nights. I also used the nocino in a Negroni Umbria, made from equal parts nocino, gin and Campari with an orange twist. The nocino and Campari work really well together and the drink taste vaguely like one of those chocolate oranges you see around Christmas time. While the $55 price tag may seem steep for a liqueur, I don't know of any American Craft Liqueur that lets their product rest for two years before bottling! Which makes this latest bottling of Skip Rock Distillers Nocino a gem and an incredible treat. And, if you'd like to pick up your own bottle you can find it in liquor stores through out Washington state or you can buy it directly through their online store. In Italy, the feast day for Saint John the Baptist (June 24th) is celebrated by picking unripe walnuts to make nocino. Nocino is a bittersweet liqueur that can be enjoyed several different way. Traditionally it is consumed neat after a meal as a digestivo to help the meal settle. You can also pour it over vanilla ice cream or swap it for vermouth in your favorite cocktails. But however you drink it, the great thing about nocino is how easy it is to make at home with a few simple ingredients and a little bit of time. If you search the internet you will find a plethora of recipes but they all follow the same basic pattern: quarter green walnuts, add sugar, spices and alcohol and let sit in a large jar from a few months to a year. Since this is the first time I've ever made nocino, I decided to try two different recipes. The first is based on a recipe from an Australian producer and the second is a variation of the recipe found in The Drunken Botanist. Disposable gloves – the juice in the walnuts will stain your skin brown if you don't wear them. Large Glass Jar – I used a wide mouth 1 gallon jar. Green (English) Walnuts – Some farmers markets will sell them but I picked mine from my boss's tree in Hayward. I also found that the larger walnuts were easier to quarter than the smaller ones. Neutral alcohol – the recipes I found were split between vodka (40% abv) and a high proof spirit like Everclear (75.5% abv), I went with everclear. Sugar – I'm sure you can go with whatever you have, but I decided to use organic raw sugar. Spices – The general suggestions are lemon peel, clove, cinnamon, star anise, and vanilla. I'm going to try a few different variations. I filled the jar with quartered green walnuts layered with 600g of organic raw sugar. Covered, I placed the jar in the sun to sit for 2 days. After the two days I will top up with everclear and store in a cool dark place for 2 months, stirring once a week. After the two months I will strain out the solids and split this batch into a couple of large mouth, quart size mason jars. In each jar I'm going to try a couple different spice mixes (cinnamon, clove, vanilla and star anise) to see which I like best. I'll let these sit till next June when I'll strain and bottle them. In a sauce pan I covered a cup of organic raw sugar with water and brought it to a simmer while stirring. I poured this simple syrup into my second 1 gallon jar and zested two small lemons. I filled the jar with quartered walnuts and topped up with everclear to sit in a cool dark corner. After two months of weekly shaking, I'll strain out the solids and split it liquid into a couple of large mouth, quart size mason jars. I'm going to try the same spice experiment describe above to try and find the right mix. I'm excited to see the process through because the bottle my boss gave me from the batch he made last year was really good. If you are interested in making your own there is still time. There are still a few weeks before the hard woody shell will start to form inside the husk. Once the hard shell forms, the walnuts will be very difficult to cut.